It's been a very busy week at Taylored Expressions as Taylor has been in Orlando Florida at CHA shopping for lots of gotta-have-it products for the TE Store. Today she'll be running a make & take at the SCS booth, so be sure to stop by if you're attending the CHA SuperShow for consumers. One person Taylor is definitley hoping to meet in person (and I'm sure wishing I was there to meet her too) is this week's Our Friday Friend Bonnie Sharp! Bonnie is known as eggette on SCS and you probably know her as one of the Dirty Dozen Design Team. You can view here SCS gallery here (where this adorable cupcake card caught our attention) and her blog is The Lucky Clucker. She has created another adorable card to share with you today using the TECC sketch from Taylor's blog. We asked Bonnie a few questions to get to know her a little better. --How did you become addicted to papercrafts? My niece literally forced me to do a scrapbook page for my mother-in-law and it was game over from then on in! After the scrapbook page, I did scrap for awhile and then in the summer of 2007 my daughter thought we should make our own Christmas cards so I bought a Christmas stamp ....and then another.....and then another.....I know you totally get that! --How would you describe your style? I used to think I could do every style....you know - "Jack of All Trades, Master of none"....Well, I know I am not a master but I think I have moved on to clean and fresh designs......I like the beauty of a clean and crisp card. I like to create cards and I've got a weird thing about magnets right now that attract me (hehe), however, it is like pulling teeth to ask me to alter something but after I do it I generally can say I enjoyed it. I am totally in awe of some of the altered projects out there in stamp land - the imagination floors me! Oh my goodness, I have to say I love them all and everytime a new SASI set comes out I get a new favorite! Get Well cards are just universal so the "Doctor's Orders" SASI is my favorite right now. One large deep glass bowl - glass is optional but it really leaves "a sweet impression" ;) I have a trifle bowl which has a flat bottom and flat sides and it just looks awesome all layered up! Layer one layer of chocolate cake on the bottom of the glass bowl. Mix up one pkg of pudding mix as directed and pour a layer of pudding on top of the cake pieces. It may ooze down between the chocolate cake layer...yummo! Layer 1/3 of the Cool-whip on top and then sprinkle 1/3 of the skor bits on top of the cool whip. Layer cake again, followed by more pudding, more cool whip and more skor bits. One more layer and you are done! Sprinkle with more skor bits - the more the better! Cover with Saran and refrigerate for a couple of hours to set. Serve with a big spoon and a smile! Bonnie - thank you for being Our Friday Friend!!! Have a sweet weekend and please come play the TECC along with us! I think I might need to try Bonnie's dessert! CONGRATS, Bonnie! Love your sweet card with that corded bow...too cute! what a fabulous lady to be the Friday Feature!! loved the interview bonnie - your dessert sounds yummy!!!! will have to make that soon i think! and your card is super sweet! This card is so adorable! Love the cute image. YAY! Loved being the Friday Friend and thank you so much for asking me! 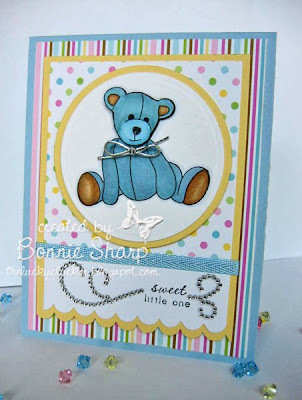 great job with the sketch, adorable card Bonnie! good to get to know you better!